By 1921, demand for the Willits Brothers canoe had grown to an all time high (Read the Canoe story). It was my uncle Earl's note that inspired me to create The Perfect Package. The concept is twofold: Offer the Canoe game enthusiast an opportunity to select the package that best fits his or her lifestyle. Provide a place to purchase the perfect gift for a friend, associate or loved one. One thing I will guarantee, whether you select the Silver or Gold edition, it will be absolutely first class...an eye opener...one that you will be proud to own. Priced From $175 - $325 - Order Now! "The MVP" leather edition is certain to bring back great memories. That old baseball glove or that weathered saddle still hanging in your tack room. 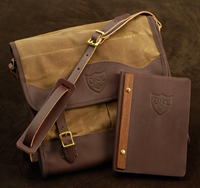 Perhaps it�s a timeless briefcase handed down from your grandfather. Whatever the leather piece, I will wager that down through the years it was well cared for. And that the leather was meticulously oiled, rubbed and buffed on a regular basis. "The MVP" is a Russet, chrome oil tanned top grain leather. Dimensions: 12 x 12 x 1/8" | Leather: Supple 5/6oz. (Sides) | Weight: 1.6 lbs. Comes with an ample supply of Pecard's exclusive leather dressing. "The MVP" is the ultimate traveler. 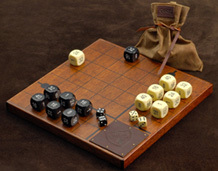 Owners will really enjoy the supple, genuine leather case designed to hold dice/cubes. A matching leather strap (with brass snap) secures the rolled up Canoe board. The MVP is truly a "go anywhere, play anytime" travel companion. Price: $68.00 - Order Now! Canoe is available in Mahogany, Walnut, Maple and Cherry. Owning a Canoe game is very special in three ways: Canoe is rather exclusive, that is to say, it is not made in volume. Each game is signed by the inventor (Bruce Alsip) personally. And each Canoe game carries its own registration number, hammered into the back of each board. Canoe boards are 12x12x 9/16 inches square with back cut tapered edges, except for mahogany which is one inch thick with square banded edges. Priced From $48.50 - $68.50 - Order Now! Any of our 3 game bags are the perfect fit. Each holds game board, game pieces bag, Canoe™ journal and more. Leather Journal Price: $34.00 - Order Now! Willits 906 Game Bag Price: $175.00 - Order Now!